Prestashop Quick Login Popup addon allows the customers to register/login their account at the same page without leaving the current page. It saves time and also improves the customer experience. Work for Prestashop Quick Login Popup Addon by Knowband? Learning about Prestashop Quick Login Popup Addon by Knowband? Amazon Simple Queue Service (SQS) is a message queuing service that decouple the components of a cloud application, it transmit any volume of data, at any level of throughput, without losing messages or requiring other services to be always available. Dragon Speech Recognition Software is a leading provider of speech, imaging and customer interaction solutions for businesses and consumers around the world. OneSignal is a complete push notification solution for mobile apps. PushEngage is a web push notifications platform, designed to help websites by sending notifications and increase returning visitors. Outbound makes it easy to send email and mobile messages based on user actions. DialMyCalls is a voice broadcasting service that allows you to set up calls, manage contacts and recordings, and get call reports. Send important alerts, notifications, and reminders in just minutes with our automated messaging service. Salesforce LiveMessage empowers companies to engage with customers through the messaging apps they love, such as Facebook Messenger and SMS/MMS. * We monitor all Prestashop Quick Login Popup Addon by Knowband reviews to prevent fraudulent reviews and keep review quality high. We do not post reviews by company employees or direct competitors. Validated reviews require the user to submit a screenshot of the product containing their user ID, in order to verify a user is an actual user of the product. Hi there! 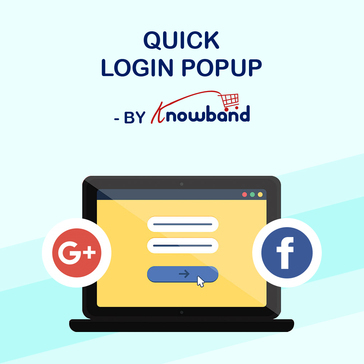 Are you looking to implement a solution like Prestashop Quick Login Popup Addon by Knowband?